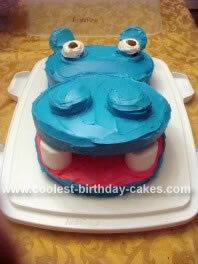 This Hippo head cake looks like a lot of work but it’s really easy to make. My 12 year old daughter Alivia loves hippos. She has very large hippo collection. When she asked me last year to bake her a hippo cake I thought, “she must think I’ve got talent!” I was quite surprised at how easy it was and how great it came out. You will need two boxes of cake mix (flavor of your choice, 2 Extra large marshmallows (let sit out over night for firmness), frosting, two round 8″ cake pans, 1 loaf pan and a cupcake pan. Pour batter evenly into both cake pans, loaf pan and only 2 cupcakes for the cupcake pan. After cooking and cooling. Place the two round cakes on top of one another and place the Marshmallows where the teeth would go to hold the mouth open. Place the loaf cake in the back (this is where the bottoms of the cupcakes go (decorate for eyes), place the muffin tops on top of the round cake towards the front (nostrils). We used blue frosting. Fondant can also be used. Have fun! This is cute what did u use for the ears?